Come join the Branson Divas for a special Holiday Lunch Show! The lunch shows will play from December 31st, 2007 – January 4th, 2008. Lunch will be served at 12:30 p.m. with the show beginning at 1:30 p.m.
Special Area Appreciation for locals (please call for pricing). For more information please call the Imaginary Theatre at (417) 332-1911 or Diva Ticket Hotline at (417) 527-5339. It’s the 14th Annual Hot Winter Fun Big Show in Branson, Missouri!! If you are interested in getting an idea of what shows Branson has to offer year round, then you need to be at the Jim Stafford Theatre on February 11, 2008! Some of the shows represented will be Jim Stafford, Legends in Concert, Doug Gabriel, Comedy Jamboree, Grand Jubilee, Baldknobbers, Celebrate America, and The White House Theatre…and others! Don’t miss this great opportunity to get a little taste of Branson at a Big Show!!! Join Christian Action Ministries (CAM) and Butterflies at Branson for their press conference to be held at Our Lady of the Lake Catholic church at 2 p.m. on January 11, 2008 (followed by a tour of CAM on the lower level of the building). Unadorned butterfly sculptures will be presented to the community and then will be taken to be finished and unveiled March 29th, 2008 at the Butterfly Palace. These beautiful sculptures will then be moved to various locations and will remain until the final auction in October, 2008. This project goes to benefit Christian Action Ministries and their work in the Branson area. Our Lady of the Lake Catholic Church is located at 203 Vaughn Drive in Branson. For more information please call (417) 334-1157. Justin Flom, Branson's rising star, brought home the People's Choice Award in an extraordinary international magic festival held for the past two weeks in Malaysia. World-renowned magicians competed by showcasing magic, showmanship and illusions of the highest caliber at the Genting International Magic Festival held at Genting Highlands Resort. Better known as Genting – City of Entertainment, it is a family holiday destination with over 18 million visitors, both Malaysians and international visitors, annually, and the world's largest resort. "I was honored to be asked to compete and am on cloud nine being selected as the people's favorite," said Flom. "Each night of the competition audience members completed a ballot to choose the entertainer they enjoyed the most. I wasn't expecting to win when they announced my name at the awards night the last day of the festival." Genting International Magic Festival is officially endorsed and sanctioned by the International Brotherhood of Magicians, the world’s largest organization for magicians with over 13,000 members in more than 80 countries spanning the globe. The People's Choice award is an honor among others Flom has earned this year. 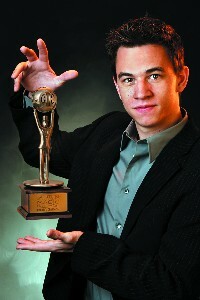 He was recently featured on the cover the International Brotherhood of Magicians magazine, Linking Ring. Flom is in his second year of having his own theater, Justin Flom's Imaginary Theatre, located on the top floor of the Majestic Steakhouse at the corner of Gretna and Roark. From the age of two Flom showed an enthusiastic interest for the art of magic and found it easy to get on stage with his dad and perform. His youth was spent performing magic with his younger siblings being billed as “The Flom Kids.” He has performed with his family overseas and been to ten different countries performing magic. At the age of 18, Flom headlined his magic show at the Branson Mall Music Theatre. By the end of 2005 construction began on the Imaginary Theatre, a venue that houses an experience-based magic show. It opened July 1, 2006. “I love that I can transport my audience to another place and let them escape their daily life. They may laugh, cry or experience wonder but they're not worrying about their regular stressful life. That's magic. It's important that I can let the audience in on the experience because the audience is the most important part of the show. Without the audience, there is no show,” he said. Several effects in his show are his own ideas. He derives satisfaction in seeing them built from the ground up, performing it in front of a live audience and hearing the approval, but, he said, “My favorite illusion is my next one.” And even though Flom was presenting his Christmas shows, he was already planning the new illusions for his 2008 season. Showtimes are 7:30 p.m. Tuesday through Saturday. For more information about the 2008 season call the box office at 417-332-1911 or go online at imaginarytheatre.com. The Imaginary Theatre is located at 2849 Gretna Rd. BRANSON, Mo. — Chateau on the Lake Resort, Spa and Convention Center will host one of the Midwest's largest New Year's Eve celebrations beginning at 7:00 p.m., Monday, Dec. 31, 2007 and featuring a colossal fireworks display over Table Rock Lake to culminate an evening of fine gourmet dining, live music, and champagne toasts. The New Year's Eve celebration starts in the Chateau's 32,000-square foot Great Hall with a festive hors d'oeuvres reception and cash bar at 7:00 p.m., followed by a plated dinner of Filet Mignon and fresh Atlantic Shrimp, and topped off with one of the Chateau's signature hand-made specialty desserts, all presented by Executive Chef Anthony J. Burke, CEC and his team of culinary experts. For a more intimate dining experience, the Chateau Grille will serve a special five-course New Year's Eve holiday meal along with their regular menu selections. Reservations are strongly advised. At 9:00 p.m., the popular Gary Myer's Band will take the stage in the Great Hall and rock the night away with dance favorites from the 70s and 80s, with a little R & B added to the mix. Guests in the quaint Library Lounge will be treated to an evening of top-notch live jazz music, a roaring fire, an award-winning wine, beer and cocktail menu, and complimentary party favors — all with no cover charge. To signal to guests in the Great Hall that it's time to bid adieu to 2007, the party hats and horns, champagne, and a giant balloon droop will roll out just before midnight. 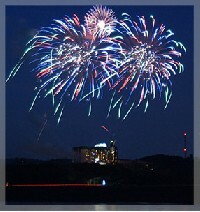 In keeping with the Chateau's signature grand style, the resort will present a spectacular fireworks display just after midnight for hotel guests and thousands of spectators whose tradition is to watch from boats on Table Rock Lake, or at one the popular viewing locations along Highways 165 & 265. No New Year's celebration would be complete at the Chateau without their famous New Year's Day Champagne Brunch featuring dozens of traditional breakfast items, along with carved meats, shellfish, cheeses, salads, and decadent desserts. The Chateau's Dixieland Band serenade during brunch is sure to inspire a few New Year's resolutions. Brunch runs from 11:00 a.m. to 3:00 p.m. in the Chateau Grille. Reservations are suggested, but not required. To make this New Year's Eve celebration safe and enjoyable, the Chateau is offering several overnight packages starting at just $399 per couple (including tax and service charges), which includes admission to the Great Hall Party, two drink tickets, gourmet dinner for two, fireworks display, and one night in a double room. The Chateau will extend a complimentary 6:00 p.m. checkout time to guests departing on New Year's Day. Area residents can take advantage of the Spa Chateau's local discount on a variety of new Spa treatments starting in 2008. For complete details on the Chateau's New Year's Eve Spectacular, please visit www.chateauonthelake.com, call toll free (888) 333-LAKE or call the resort directly at (417) 334-1161. Chateau on the Lake, known for its superb mountain top location and world-class hospitality, is Southwest Missouri's only AAA four-diamond resort. Chateau offers a wealth of recreational amenities for guests including the new $6 million Spa Chateau, heated indoor and outdoor pools and hot tubs, 24-hour fitness center, nature trail, two lighted tennis courts, and a full-service marina. Other offerings include The Crawdaddies Kids Club with castle playground, a movie theatre, full-service concierge, two shops, and five restaurants and lounges including lake-view dining at the award-winning Chateau Grille. A stunning 10-story sky-lit atrium lobby complete with running streams brimming with Koi fish, lush foliage, exotic flowers and towering trees adds a touch of drama to every arrival. Chateau on the Lake is a member of the Springfield, Missouri-based John Q. Hammons family of award-winning hotels. John Q. Hammons Hotels & Resorts is the nation's leading independent builder, developer, owner and manager of upscale, full-service hotels, resorts and suites, including: Embassy Suites Hotels, Renaissance, Marriott, Radisson, Residence Inn, Homewood Suites by Hilton, Holiday Inn and Courtyard by Marriott brands. For more information about John Q. Hammons Hotels & Resorts, please visit the company's website at www.jqhhotels.com. Enjoy the Landing Princess 4 1/2 hour cruise this New Year’s Eve. While on the cruise you will experience dining, entertainment, dancing, and a fantastic view of the Branson Landing’s Fire & Watershow. Gift certificates and private parties are available. For more information or to make reservations please call 1-417-239-3980. The Branson Veterans Task Force is looking for donations or gifts to make baskets for the awards program at Whiteman Air Force Base. Each year Branson area businesses have participated in this event and it is very much appreciated by those serving to protect our freedom. In January 2006 the 442nd Fighter Wing dedicated a A-10 Thunderbolt II jet that was named “Thunderbolt of Branson”. What a honor for Branson. The 2008 awards program has been moved from February and will take place in January. You can drop off your donations at the Task Force office, 158 Pointe Royale Dr. or call 417-337-8387 and make arrangements to have your donations or gifts picked up. If you have any question please call 337-8387. The annual winter coat drive for Taney County will be taking place the months of December and January. Anyone is welcome to donate a new or gently used winter coat or jacket. Drop off locations will be OACAC located at 115 Corporate Place (Branson), phone number 417-239-1882. Christian Action Ministries (CAM) will also be accepting donations at 202 Vaughn Road (Branson), phone number 417-334-1157. You may also bring your coat or jacket donation to Comet Cleaners on Hwy 248. Comet Cleaners has also agreed to clean coats and jackets left at their location before they are distributed to those in need. BRANSON, Mo. — Spa Chateau at Chateau on the Lake Resort, Spa and Convention Center wants to help you find the perfect gift for that hard to buy for man, woman or teen in your life. There's no better gift than that of ultimate relaxation and to start the New Year off right, Spa Chateau today announced four new spa packages for 2008. The Winter Warming Package is designed to chase away the winter blues and soothe dry winter skin. Featuring a skin nourishing milk bath and an 80-minute Hot Stone Massage on a heated massage table, the Winter Warming Package makes a great holiday gift for anyone who enjoys having particular attention paid to soothing their skin. The ultimate gift for two is the Spa Signature Package which features the White River Bathing Ritual in a dual tub, followed by an 80-minute Grand Chateau Massage in one of the Spa Chateau's 10 luxurious treatment rooms. Couples can spend an entire day at the Spa and enjoy the co-ed indoor and outdoor Roman whirlpools, sauna, eucalyptus steam room and dine on items from the Spa Menu in the private men's and women's relaxation lounges overlooking Table Rock Lake. Also for couples, the Royal Celebration of Love Package, which makes a great Valentine's Day gift, features a 30-minute White Bathing Ritual followed by an 80-minute Grand Chateau Massage. Ladies who want the perfect gift for a female family member or girlfriend can check out the Girlfriend Spa Destination Vacation. It includes an entire day of Spa pampering starting with a soak in the indoor or outdoor heated Roman whirlpool, a visit to the sauna and eucalyptus steam room, and either the Chateau Dogwood Signature Massage, the Talking Rocks Host Stone Massage, or the Slim and Tone Wrap. The package also includes two beautiful Spa Chateau tote bag gifts. For the hard-to-buy-for men in your life, the Chateau offers an exclusive Barber Spa featuring a la carte items such as the hot lather shave, haircut, mustache & sideburn trim, manicure, and foot massage, which compliment the Spa's full range of therapeutic massage service. Teens and children as young as 8 years-old, when accompanied by a guardian, can enjoy a large selection of services at the Spa. A la carte items at the Image Center Hair Salon make great stocking stuffers and include haircuts, manicures, pedicures, facials, waxing, and expert makeup application for special occasions. For those new to the art of makeup application, the Spa offers makeup lessons —- a great gift idea for the teenager on your Christmas list! 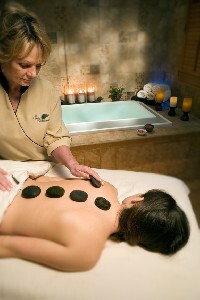 For more information on these and other Spa Chateau services, please visit www.chateauonthelake.com, call toll free (888) 333-LAKE or call the resort directly at (417) 334-1161. The 14,000-square foot Spa Chateau was recently profiled in "Best Spas USA, The Guidebook to Luxury Resort, Hotel and Destination Spas." Spa Chateau is among 40 spas in 17 states, and the only one in Missouri, featured in both the guidebook and on the accompanying website, www.bestspasusa.com. The European style two-story spa boasts signature treatments such as the Chateau Dogwood Signature Massage and the Royal Shave. The Chateau's 10 luxurious treatment rooms feature hydraulic-operated massage tables complemented by plush heated padding and dressed with Comphyïƒ’ skirting, sheets and comforters for maximum relaxation. In-residence and poolside massage services are available to guests staying at the hotel. The Fitness Studio inside the Spa offers a breathtaking Table Rock Lake view, state-of-the-art equipment, personal training services and Yoga classes among others. Chateau on the Lake, known for its superb mountain top location and world-class hospitality, is Southwest Missouri's only AAA four-diamond resort. Chateau offers a wealth of recreational amenities for guests including heated indoor and outdoor pools and hot tubs, 24-hour fitness center, nature trail, two lighted tennis courts, and a full-service marina. Chateau on the Lake is a member of the Springfield, Missouri-based John Q. Hammons family of award-winning hotels. John Q. Hammons Hotels & Resorts is the nation's leading independent builder, developer, owner and manager of upscale, full-service hotels, resorts and suites, including: Embassy Suites Hotels, Renaissance, Marriott, Radisson, Residence Inn, Homewood Suites by Hilton, Holiday Inn and Courtyard by Marriott brands. Ring in the new year at The Roy Rogers-Dale Evans Happy Trails Theater and Attraction in Branson. Not only will there be plenty of great food, wonderful entertainment and loads of fun, but you can wear your jeans and cowboy boots! No tuxedo is required for this event, so make plans now to attend this cowboy-style party, Monday December 31 at 8 pm. Tickets are just $60 per person, and include appetizers, admission to the Museum Attraction, and a ticket to the Show. Call 417.339.1900, extension 225 for reservations.